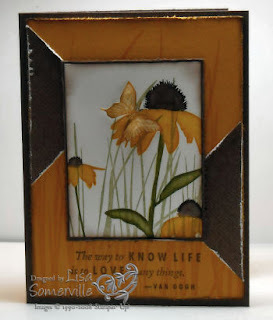 Hold on to your seats and check out some of the Bloggers Challenge Players work. If you'd like to play along - just upload a link to your card to this post. Happy Friday! Lisa, these are awesome, the top card with the flowers on it is my fave. The colours are magic. Excellent cards, Lisa -- just gorgeous. Great job on both cards, but I'm really drawn to the Inspired by Nature one. The colors are gorgeous! Wonderful job on both these cards. 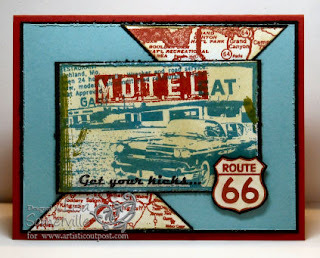 Love the colors on the Route 66, but the flower card is Primo!! Oh Lisa, these are great. I so LOVE this layout...I can see me CASING it very soon. Superb Cards! - I almost used that sketch too. I'm so liking that floral image and you used it well. Love the Nostalgic Look of your 2nd card. Lisa! I almost picked this sketch until I remembered the one I did choose! Love what you did with both cards! That inspired by Nature is so you...love how you sneak a butterfly in on it everytime! These are awesome. I especially love the flower one. Great cards, Lisa! The Inspired by Nature card is stunning. Love, love, love this layout. I especially love the card using the "Inspired By Nature" stamp set. Wow! These are cards! I thought for sure the first was a wooden frame! AWESOME!!! Great cards! I especially like the one using Inspired by Nature! So pretty. Great job, tfs. Both cards are super--I just LOVE the Inspired by Nature one though. WOW Lisa- These are both wonderful! Love the elegance of the one and the other is a wonderful take on masculinity! TFS! They are both wonderful cards! I love the flowers in the first card! Perfect colors! That sketch challenge was a fun one. Have a great week!